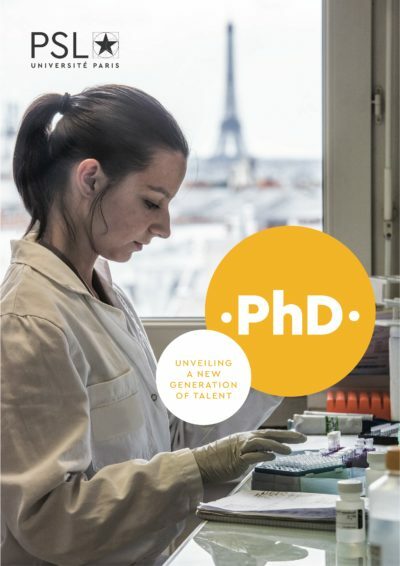 In accordance with the decree of May 25, 2016 establishing a national framework in France for the education and conditions leading to a French PhD diploma, and in order to guarantee the independence of the juries required for the evaluation of a thesis, the PSL Doctoral College has, at its meeting of March 7, 2018, decided on the following modalities. Authorization for a dissertation defense is granted by the head of the institution, who is advised by the director of the doctoral school based on a recommendation from the dissertation supervisor. The doctoral candidate’s work is first examined by at least two committee members HDR or comparable, appointed by the head of the institution, based on a recommendation from the director of the doctoral school, who is advised by the dissertation supervisor. For work that involves people from the business sphere rather than academia, a third committee member, recognized for his or her expertise in the field, may be appointed based on a recommendation by the director of the doctoral school, who is advised by the dissertation supervisor. The committee members must be external members of the Doctoral School and the PSL University (except derogation if the disciplinary field or the contents of the works don’t allow it) and have no implication in the work of the thesis. The committee members submit a written report on the presented work at least 14 days before the schedule date of the oral defense. Authorization for a defense is granted based on the reports, which are communicated to the jury and the candidate before the defense. The writing language of the thesis must comply with Article L121-3 of the Education Code, relating to the use of the French language. at least one of the rapporteurs must be anglophone, in order to guarantee the quality and the level of the English language used, and his report will be written in English. For each dissertation, the jury is appointed by the head of the institution, who is advised by the director of the candidate’s doctoral school and the dissertation supervisor. half of the jury must be made up of professors (or comparable experts as defined by the conditions for appointing members of the French national council of universities), or of faculty members of equivalent rank not employed by the French ministry for higher education. It must include a balanced representation of men and women. One of the members of the jury must be a researcher of PSL, holder of the HDR. At least half of the members of the jury must not have taken part in the thesis work. The chairman of the jury must be a professor or comparable. The dissertation supervisor participates on the jury and attends the deliberations but does not take part in the decision. S/he may not chair the jury. Personalities can participate as guest members (maximum two). A member invites a seat during the defense but does not sign the documents relating to the defense and is not considered as an examiner. Cases of cotutelles: if specific provisions have been specified in the cotutelle agreement, attach a copy of the agreement when submitting a jury proposal. A defense is public unless a special waiver is granted by the head of the institution, if the dissertation topic is established to be of a confidential nature. After deliberating, the jury decides whether to pass the candidate or adjourn. In special cases, with the exception of the chairman, members of the jury may participate in the defense via videoconferencing or electronic communications that allow them to be identified and to participate effectively in collective deliberations. The chairman signs the defense report, which is countersigned by all members of the jury present at the defense. The defense report is sent to the doctoral candidate within a month following the defense. The chairman advises on whether the dissertation can be published as is or after corrections. If the dissertation was filed electronically in the STAR application (for electronic dissertations, archiving, and research) implemented by ABES and CINES, doctoral candidates must comply with PSL’s rules on electronic dissertation publication. The supervisory team is responsible for ensuring that these deadlines are met and that the documents filed meet the requirements (cover template, abstracts on the back cover, dissertation title, jury members, Cotutelle notice, etc.). The front and back pages of dissertations must reflect the PSL style guide. Generic templates are available in the Resources space, to be filled out under the authority of the dissertation service at the institution where the dissertation is prepared. Vigilance is recommended if a confidentiality clause applies to the doctoral dissertation: the confidentiality notice and the end date must appear on the cover of the dissertation. Unless there is a confidentiality clause, the institution hosting the defense shall provide access to the dissertation internally and within the university community. Online publication of the dissertation beyond this scope is subject to permission from its author, assuming there is no confidentiality clause. A diploma is awarded by the institution in charge of the defense once the final version of the manuscript has been filed in STAR, providing that the documents related to the defense and publication of the dissertation have been submitted to the dissertation service at the institution in charge of the defense. The new PhD has a maximum of 3 months after the defense to close his or her dossier. The degree awarded is a PhD from PSL (Paris Sciences & Lettres) – Université PSL, prepared at [the institution where the dissertation was prepared]. The PhD diploma is signed by the President of PSL and by the Rector of the Academy of Paris, chancellor of universities. The service in charge of academics for doctoral candidates at the dissertation preparation institution or the PSL dissertation service in charge of your administrative requirements. Unless administrative management responsibilities have been delegated, the head of the institution at which a dissertation is prepared is in charge of authorizing a dissertation defense, appointing committee members, appointing the jury, confirming the award of a degree, and the dissertation publication contract.